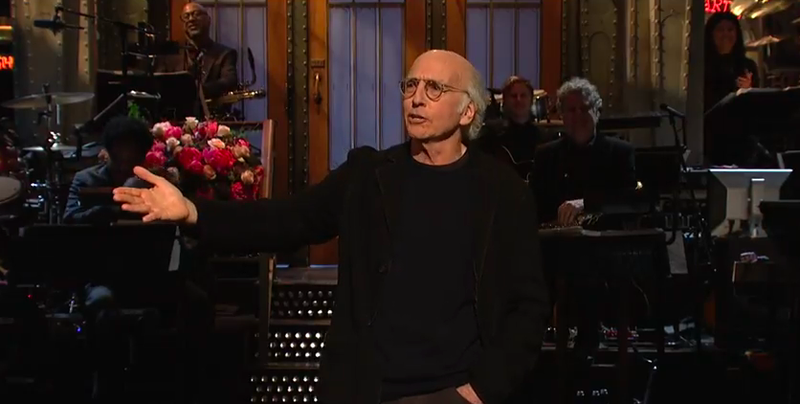 Hosting last night’s Saturday Night Live, Larry David came out loose. His monologue saw the comedy legend clad in his signature casual attire, an attitude mirrored in his perhaps too relaxed approach to opening his second SNL hosting gig. After all, he’s Larry David. What does he have to do to win over a crowd at this point? Well, evidently not do Holocaust jokes, or at least not the particular Holocaust joke that has set off a predictable furor that will no doubt rage online for a day or so until the next internet-fueled outrage sweeps across your Twitter feed. Watch David’s monologue below… if you dare! That being said, David’s monologue wasn’t his best, with potentially risky material (about disabled people, Harvey Weinstein, and that whole pesky “hitting on women in a concentration camp” thing) lacking the wit or imagination to make much of it seem like anything but lazy provocation—or just plain lazy. “I think I’m doing quite well,” David joked at one point, clearly relishing the fact that, from the audience non-reaction to most of his jokes, he was bombing, hard. If there’s a consistent theme in any mass reaction to “edgy” humor, it’s that a lot of people argue about it less out of a deep understanding or appreciation of the nature and limits of the craft of comedy, and more to graft their own opinions onto what was in this case (at least in our reviewer’s opinion) a weak set all around. But for those itching to teach a 70-year-old comedy titan (and Jewish man) about the propriety of telling Holocaust jokes, keep in mind that he’s Larry David, and, as his career shows, he really doesn’t care what you think of his sense of humor.